This diagram shows the propagation of signals between Rosetta and Philae through the nucleus of Comet 67P/Churyumov-Gerasimenko, between 12 and 13 November 2014. Green represents the best signal quality, decreasing in quality to red for no signal. The signals are sent and received by the CONSERT instrument, which is on both the orbiter and the lander. The time taken for the signal to travel between the instruments, and the amplitude of the received signal offers insights into the structure of the comet's nucleus. In particular, the travel time depends on a parameter called permittivity, which is itself linked to the nucleus porosity, composition, temperature and internal structure of the comet. 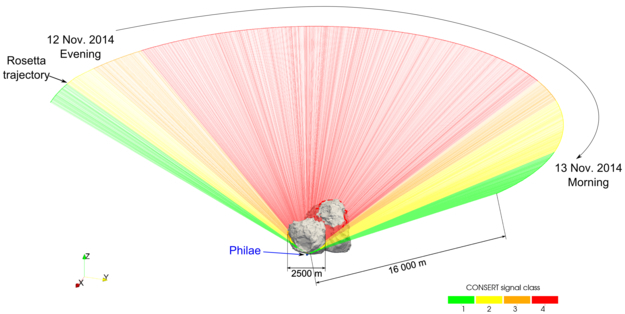 Indeed, the results show that the small lobe of the comet is consistent with a very loosely compacted (porosity 75–85%) mixture of dust and ice (dust-to-ice ratio 0.4–2.6 by volume) that is fairly homogeneous on the scale of tens of metres. The permittivity value is approximately 1.27.